"The Grahams' system is the best way to transform data and ideas into meaningful information necessary to make profitable decisions. Their system works every time." "The Grahams' straightforward program helps my teams create clear and concise reports, letters, and other documents with minimal effort. I want this program to become the standard for my teams." "The Can Do Writing system made my career! I used it to write a winning business plan and proposal, and now I use it every day for all communications. Can Do Writing provides valuable insights into business and management as well as writing techniques." You may be an expert at what you do, but if you can't communicate effectively in writing it may not matter. For scientists, businesspeople, and professionals in fields from engineering to public relations, the art of writing well can be a vital key to professional success. Over the past twenty years, Daniel and Judith Graham have trained more than 70,000 business and technical professionals in this practical writing system. They've helped global corporations and government agencies alike streamline communications while increasing profits. 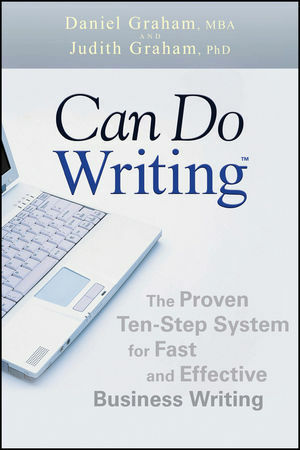 Now you too can learn Can Do Writing's ten clear steps—and put writing to work for you. Step 1 Analyze Purpose and Audience. 1.1 What Result Do You Want from the Document? 1.2 Who Is the Audience? 1.3 What Does the Audience Do with the Information? 1.4 What Information Does the Audience Need? 1.5 Does the Audience Know Little or Much About the Information? 1.6 Does the Audience Need Proof? 1.7 Plan How to Write to Multiple Audiences. Step 2 Write Your Document’s Five-Part Purpose Statement. 2.1 Decide the Type of Document or Oral Communication to Use. 2.2 Pick a Verb That Describes What the Document Does. 2.3 Assemble the Five Parts into a Purpose Statement. 2.4 Use the Purpose Statement to Settle Controversies. Practice Steps 1 and 2 Using a Case Study. 3.1 Use the Purpose Statement As You Select Facts. Step 4 Organize Your Points in a Sentence Outline. 4.1 Write Your Points Using Short Words in Short Sentences. 4.2 Evaluate Points to Eliminate Irrelevancies and Redundancies. Practice Steps 1 through 4 Using a Case Study. Step 5 Compose the Draft. 5.1 Compose the Draft Body. 5.2 Compose the Draft Conclusion. 5.3 Compose the Draft Introduction. 5.4 If Necessary, Compose the Draft Executive Summary. 5.5 If Necessary, Compose the Draft Abstract. Step 6 Review the Draft for Organization and Logic. 6.1 Test Organization by Answering Three Questions. 6.2 Use Sentence Outlining Techniques to Improve Organization. 6.3 Test Logic by Answering Five Questions. Step 7 Edit for Coherence. 7.1 Repeat Key Words throughout Your Document. 7.2 Ensure That Each Paragraph Begins with a Point. 7.4 Use Vertical Lists for Series of Like Items. 7.5 Ensure Your Graphics Make a Point. Step 8 Edit for Clarity. 8.1 Use Concrete and Specifi c Words. 8.3 Simplify Tense: Stay in Present Tense When Possible. 8.4 Avoid the Helping Verbs Would, Should, and Could. 8.5 Identify and Replace Ambiguous Pronouns. 8.6 Use Standard English Words. 8.7 Check Sentences for Misplaced or Dangling Modifi ers. Step 9 Edit for Economy. 9.3 Cut Who, Which, and That. 9.7 Cut Useless Modifi ers. Step 10 Edit for Readability. 10.1 Measure Readability Using the Gunning Fog Index. 10.2 Replace Long Words with Short Words.